CARBS! Eat them, Mostly Complex, GO... - Fit Chicks! 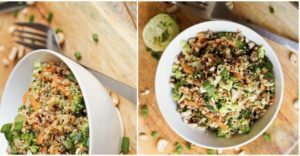 You asked for healthy recipes so I give you an Asian Shrimp Barley Bowl. 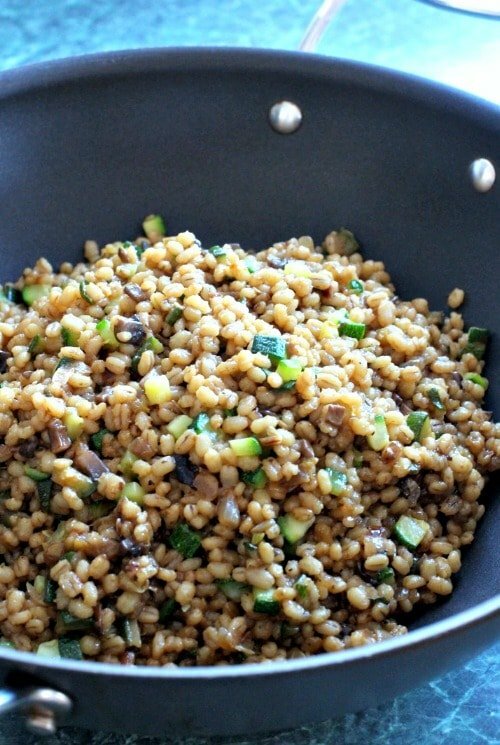 It’s healthy, easy and if you make the barley ahead of time, it’s a 15 minute meal! OK, I know what you’re thinking – barley? I’ve gone totally over the edge. It’s not as crazy as it sounds, I promise. It takes about 45 minutes to cook up a pot of barley but you can do it ahead of time and then like rice, it’s something you can add anything you want to. But it’s a lot better for you than plain rice. 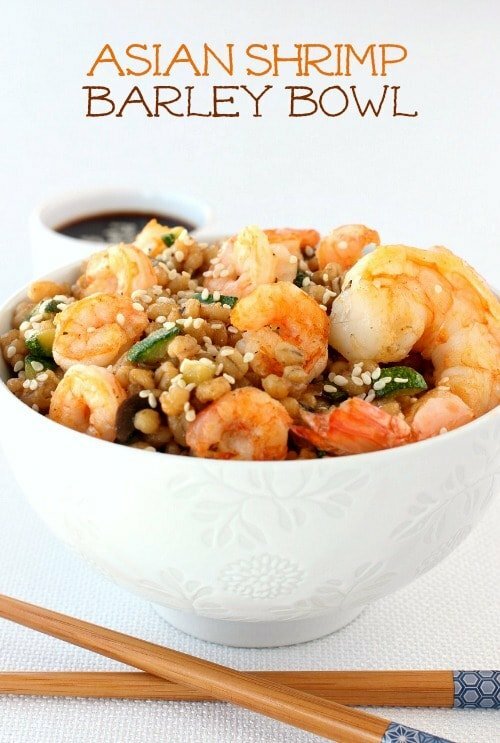 So if you can make the barley ahead of time, then when it’s time for dinner you only have about 15 minutes of cooking to get this Asian Shrimp Barley Bowl on the table. When dinner time comes, get your barley out of the fridge and warm it up over low heat. Get out a large skillet for your shrimp…season them with salt and pepper and cook for 5 minutes until they’re just pink. It might sound like a lot of steps – but it’s really not too bad – especially if you do the barley ahead of time. So that’s how I do healthy. Not a boring salad or steamed vegetables. Tasty, delicious, full of flavor dinners that just happen to be good for you too! In a large pot, heat up the olive oil over medium heat. Add the diced onion and cook, stirring, for 5 minutes. Add the sugar to the onions and stir. Cook the onions, stirring often for another 5 minutes until they start to brown and caramelize. Add the diced zucchini , and shredded (or “riced”) veggies like Brussel Sprouts, asparagus, cauliflower, broccoli and radish, plus garlic, salt and pepper to the onions and stir. Cook for another 5-9 minutes until the vegetables softens. Remove the vegetables to a plate to cool. To the same pot, pour in the chicken broth and bring to a boil. Add the barley and another ¼ teaspoon of salt and bring back to a boil. Reduce the heat to a simmer and cook for 45 minutes. Place the cooked vegetables along with the soy sauce and sesame oil back into the pot and stir to combine with the barley. In a large skillet, heat the other tablespoon of oil over medium-high heat. Add in the shrimp and season with salt and pepper. Cook for 3 minutes, then turn to the other side and cook for 2 more minutes until pink. Spoon the barley into large bowls and add the shrimp on top to serve. Make the barley ahead of time, then when it’s time for dinner all you have to do is saute your shrimp and add it to the warmed up barley. 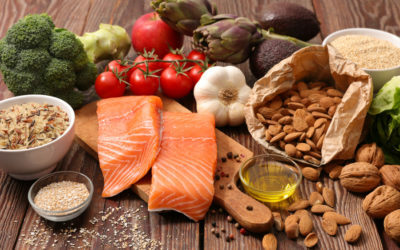 You could also leave out the shrimp for a vegetarian meal, or substitute chicken or sliced beef or a white fish instead. Facebook – LIKE and leave a review with comments, thank you!